The goal of the game is to keep as many beacons lit at the same time as possible. There are a total of 14 beacons in the Beacon Network which is indicated by the Fired Up Beacon icon( ) on the World map and minimap. Players gain rewards based on how many beacons that they can keep lit at the same time, broken into three groups: 6 beacons, 10 beacons, and all 14 beacons. To get the rewards, you have to speak with King Roald III in Varrock. Note that you may choose to gain all three rewards in one trip. To light a beacon, players must first fill the brazier with 20 of the same type of logs. Players may use any type of logs but the better logs used, the longer the beacon will stay lit. After filling the beacon, players must use a tinderbox on the beacon to light it. Lighting the beacons give a fixed amount of experience and is not dependent on the logs used. Players do not have to light the logs as soon as they fill the brazier. It is recommended that you fill all the braziers first then go from brazier to brazier lighting them. In addition, players may choose to light the beacons in any order; load the beacons in one order. Friends can also help each other in this Activity. Player "A" provides an inventory of logs to some friends and asks them to wait at the beacons. Once player "A" arrives, the friend gives them the logs. If player "A" uses cheap logs, they will not go over the trade limit. Players may save money by using cheap logs on the beacons that will be lit last. The money saved can be used to buy longer-lasting logs on the beacons that will be lit first. You can use the salty pool in Oo'glog for unlimited run for a set amount of time. Edgeville Northern part of Edgeville, this beacon is not in the Wilderness. 62 - - Light all up to here for your first reward. Death Plateau In the Wilderness east of Death Plateau (area). Not accessible from Death Plateau, Trollheim or Burthorpe, only from the Wilderness. 79 Level 42 Construction; a hammer, 2 planks, and 4 nails to repair the ladder. Provide the keeper a cooked lava eel (requires the completion of Heroes' Quest). Light all up to here for your second reward. Frozen Waste Plateau On the Frozen Waste Plateau, west of the Agility course deep in the Wilderness. 92 - No Keeper Light all for your third and final reward. For successfully lighting either 6, 10, or all 14 beacons without letting one go out King Roald III will give you a reward. After successfully lighting 6 beacons you are rewarded with the Ring of Fire. The Ring of Fire grants an extra 2% more experience for each log you ignite. Sadly, the Ring of Fire has no combat stats what so ever. You must have a firemaking level of 62. 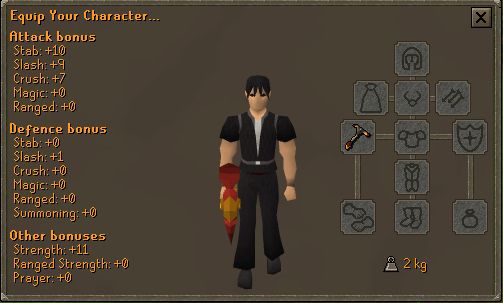 After successfully lighting 10 beacons you are rewarded with the Flame Gloves. The Flame Gloves grant a extra 2% more experience for each log you ignite. They can be used along with the Ring of Fire to give you 5% extra experience per log instead of the usual 4%.Like the Ring of Fire, the Flame Gloves do not have any stats. You must have a firemaking level of 72. After successfully lighting all 14 beacons without allowing one to burn out, King Roald III will grant you the Inferno Adze. 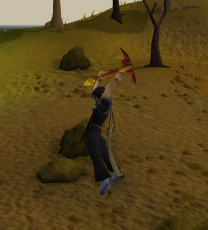 The Inferno Adze acts like a Dragon Hatchet while woodcutting, and as a Rune Pickaxe while mining. 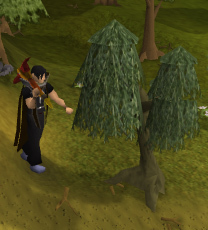 To use the Inferno Adze as a hatchet, you will need 61 Woodcutting and 92 Firemaking. And to use it as a pickaxe, you will need 41 Mining and 92 Firemaking. The Inferno Adze's requirement of 92 firemaking is the highest skill level needed to wield any piece of equipment, not including the skillcapes. Should you die with the Inferno Adze, you must light all the 14 beacons again to re-obtain it. Lighting all the beacons while already having the Inferno Adze does not reward you with another Adze. Although you can obtain the Inferno Adze by using orange spicy stews to light the beacons, you will not be able to wield it until you have a Firemaking level of 92 or more. While woodcutting with the Inferno Adze, the Inferno Adze will randomly incinerate your logs giving you firemaking experience. This is a known way to light the beacons. You do not have to follow this step by step although it is recommended. Stop at beacons 6, 10, or 14. Depending on what reward you are aiming for. Fix all of the beacons. Load all of the beacons. The first two can be filled with Yews / Magic Logs (Strongly recommended but optional, Maples will work fine). Get a tinderbox, Lightweight clothing, Terrorbird pouch, Terrorbird scrolls, Teleports, At least 4-5 Pieces of Food. Light beacon #1 (River Salve) and give the keeper logs to keep it alive when it's dying. Light beacon #2 (Rag and Bone Man) and give the keeper logs to keep it alive when it's dying. Run to the Jolly Boar Inn to light beacon #3 (Jolly Boar Inn). Use the Terrorbird special to keep running. Run West to beacon #4 and #5. Light beacon #4 (North of Varrock Castle) and #5 (north of Grand Exchange). You might want to renew your summoning points on the bridge to the Grand Exchange so they won't run out. Light beacon #6 (Edgeville) and #7 (Black Knight's Fortress). When you get to beacon #7 teleport to Goblin Village by using a teleport sphere. Light beacon #8 (Goblin Village). Teleport to Burthorpe and light beacon #9 (Burthorpe). Go south and down some rocky cliffs to go to the wilderness. Run South to get to beacon #10. Climb up to get to beacon #10 (Death Plateau) and light it. Teleport to Trollheim and run past the Thrower Trolls with Range Protection on. Climb the path nearest to the Death Plateau and light beacon #11 (Trollheim Shortcut). Teleport to Trollheim again and go to the God Wars Dungeon. Go a little North from the dungeon sip your Super Restore Potion and light beacon #12 (God Wars Dungeon). Sip a Super Restore Potion and run north and light #13 (Small temple). Run north and light the last beacon #14 (Frozen Waste Plateau). You should get a message saying that you have some rewards from King Roald III. 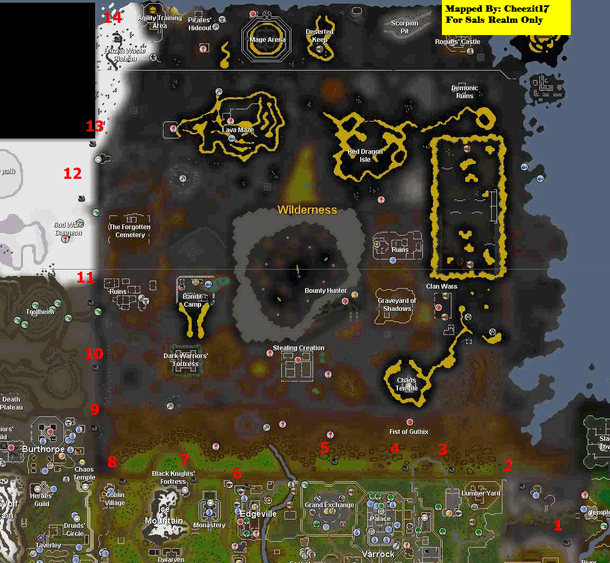 So, go to Varrock (You can teleport using the Ancient Obelisk until you get to level 20 Wilderness and teleport to Varrock.) Talk to King Roald III to claim your reward. After fixing the ladders and filling the beacons, teleport to Trollheim, go to the bottom of the mountain using the shortcuts. Turn on Protect from Range, and run towards the God Wars Dungeon. Drink Super Restores (to restore all stats) as and when necessary. Light the beacon here. Light the beacon at this location. Climb down the Agility shortcut into the Wilderness, accepting all warnings if necessary. Run south, and light the beacon at Death Plateau. Then, begin running directly north. You will reach a temple, the Chaos Temple. Once here, there should be a ladder a little further north which, when climbed, takes you next to the beacon. Light the beacon here. Climb down the ladder and run north. You will reach a gate, go through it. Then, run slight northeast, and you will reach the Frozen Plateau Beacon. Light this. Begin running back to the gate, and through it. Run southeast, turning Protect spells against the Ice Warriors/Giants/Revenants if required. You will reach an obelisk. Click one of the four supports and a pulsating orb should appear in it. Climb onto the Obelisk and move into the center. You should be teleported, hopefully to another obelisk below level 30 wilderness. If so, Glory Teleport out, or if its below 20 wilderness, use a Games Necklace to teleport to Burthorpe Games Room. Either way, make sure you end up at the Games Room. Climb up the stairs and run east towards the beacon. Climb up the iron pegs and light this beacon. Use a Goblin Village Sphere to teleport you to Goblin Village, and run in a northeasterly direction (Goblin Village Spheres teleport you within a random location of Goblin Village) and light the beacon here. Use your Amulet of Glory to teleport to Edgeville, and light the beacon north of the bank. Run east, pass over the bridge, and jump over the ditch. Continue running east, and a little north till you come to a beacon. Light this. Continue running east and you will reach another beacon. Light this. Continuing on, light another beacon to the east of the last one. Jump over the ditch and run through the gate to Canifis. Follow the path until you reach some steps which lead towards the Odd Old Man from the Rag and Bone Man quest. From him, run slightly west, and climb the steps. Light the beacon here. Run back down the steps, and continue following the path until you reach the Paterdomus Temple. Light the beacon here.